A group of international artists staged a performance today in a Turkish branch of luxury cosmetics store Clinique in protest against its chairman's involvement with Israeli ethnic cleansing and occupation in Palestine. This is the latest action in the growing campaign against the Jewish National Fund (JNF), a Zionist organisation which facilitates the transfer of Palestinian land to Jews while parading as an environmental charity. 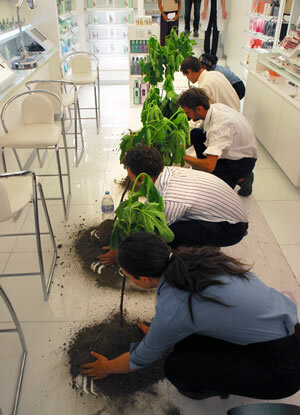 Five members of performance arts group Rezoning Group entered the store in Istanbul dressed up as members of the JNF and proceeded to “plant” trees over the Clinique shop space on Friday 10th June, forcing the store to temporarily close. This was to draw a parallel with the actions of the JNF, which has been involved in forcibly appropriating Palestinian homes and ”rezoning” them under an ecological reforestation scheme. By this “planting” of trees without prior announcement or permission, the Rezoning Group say they wish to highlight the very activity engaged in by the JNF on Palestinian lands.